Successfully Added Auto Balancing RC Robot - Five Characteristics, Walking, Load Bearing, Fight Mode, Gesture Sensors, Dancing and Singing (White) to your Shopping Cart. The HG 2.4G Auto Balance RC Stunt Robot is the perfect toy for young and old that is guaranteed to bring hours of joy and entertainment into your household. 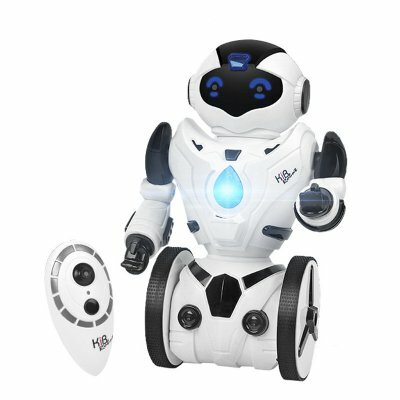 With its futuristic looks and numerous of entertaining features this RC robot pet will leave an ever lasting impression at your child that is guaranteed to turn into an extraordinary and fun memory. This RC robot toy features five different characteristics, each of which tells the robot to perform a unique task. Besides simply walking through your living room this magnificent little stunt robot is capable of dancing, singing, carrying objects, following hand gestures, and engaging in true robot battles with similar robot toys. By enabling the robot’s dancing mode he will sing and dance along with all your favorite songs. No longer will there be the need to listen and dance to all your tracks on your own, from how on your self balancing robot toy will show you his moves and share the fun with you. Its smart hand and gesture sensors additionally give you the option to program your robot pet to follow the movement of your hands. Simply hold your hand in front of its sensor and the robot will follow you where ever you’re headed so you’ll never have to walk alone again. The robot’s fighting mode furthermore brings along hours worth of joy as from now on you will be able to reconstruct your own miniature robot battles in the comfort and safety of your own living room. Its load bearing function along with the robot’s amazing balance make it able to carry around small objects while moving on a smooth surface. Why not let this self balancing stunt robot work as a waiter and serve your children with a delicious cold drink or snack? Your children along with all their friends will be filled with joy when they see the HG 2.4G Auto Balance RC Stunt Robot serving their meal. Coming with its own remote control this robot toy can be easily controlled. Switching in between the different characteristics of the robot can easily be performed by the touch of a button and the color light at the chest of your magnificent robot pet will indicate the current mode it is in. With its futuristic looks this friendly robot is the perfect gift for young and old – guaranteeing to bring along hour of joy and excitement.